This is a white wash paint finish for furniture. I kind of winged it on this project. I enjoy playing with paint and trying new techniques. With paint if you mess it up just paint over it. No problem, just a little extra time and supplies. If you don’t try out new ideas, well you might miss something really special. The chest was a total mess. I call it the horse eaten chest of drawers. When I purchased this chest it was in one piece. While loading it in the truck the top section separated from the bottom. That could have been really bad. I always worry when moving and loading furniture. My husband and I and a lot of people we deal with aren’t spring chickens. I would be really upset if someone was injured while moving furniture for me. Thank goodness this time the only one injured was the chest of drawers. Now in two pieces the chest looked really bad. Apparently part of it’s history included being stored in a barn…..occupied by a horse…..who thought the chest was his personal chew toy. The pictures do not show the devastation caused by the horse. The molding around the top is a mess. It’s eaten up and has lots of sharp edges and hunks of missing wood. Oh, but It was calling my name. The details are awesome. I have no idea the age of this piece but it’s solid wood everywhere, and it is heavy. The purchase price was $95. Much more than I usually spend for a chest of drawers. I was sucked in by all those details. I saw potential. The Junktion Technical Specialist glued the top onto the bottom part of the chest and used a router to smooth the top edge. It wasn’t perfect but I didn’t want to replace the top piece, so it worked for me!! Even at $95, I couldn’t pass up this chest with all the lovely details. And those legs…..who could resist those. I love frosting don’t you? My favorite part of the cake or cupcake is the frosting. I even have some ice cream with frosting swirled through it. So I thought for this special piece of furniture I would give it a little frosting! I’ll tell you exactly how I got “the look”. 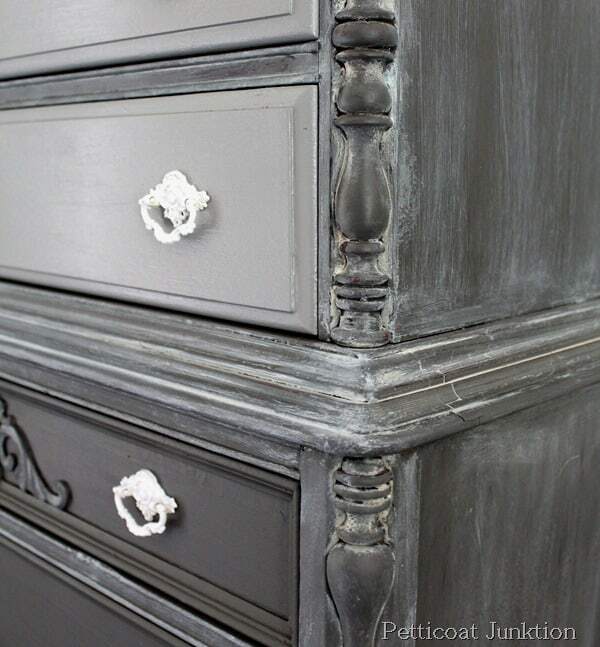 I combined Beyond Paint colors Licorice and Mocha, and Rust-Oleum White Latex paints to make a taupey gray color. That’s the best I can explain the color. You guys know I love to mix paints. 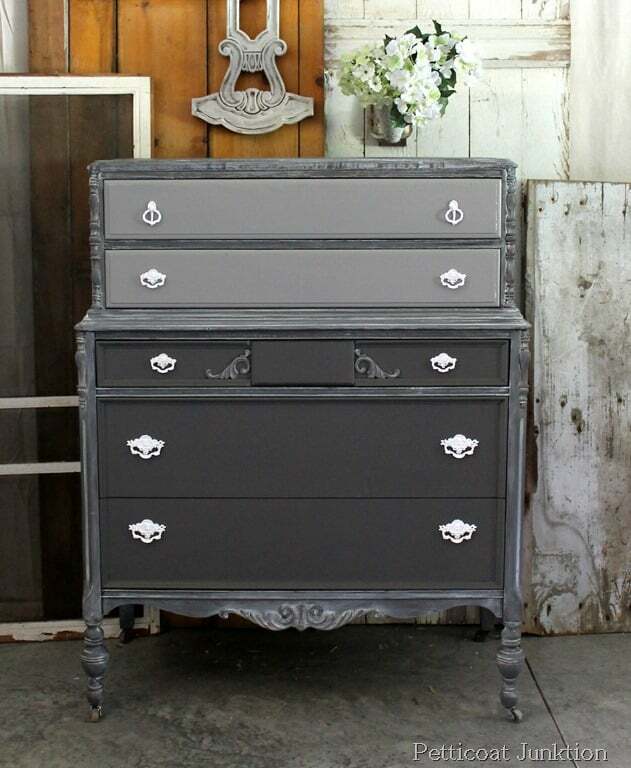 I painted the casing of the chest and the bottom three drawers with the paint mixture then I added some white paint to the taupey gray color paint to lighten it up and painted the top two drawers with the new paint mixture. I love the contrast of the two colors. The original hardware was in good condition but the two knobs on the top drawer had been replaced with new shiny brass knobs, yuk. I went through my stash of hardware and found two replacements. I spray painted all of the hardware off-white, then decided I wanted a white-white. So I sprayed them again. Don’t you just love spray paint. Now for the frosting. I thought I had some glaze in a can that I purchased a long time ago. But I couldn’t find any, so maybe I dreamed that. I did have some antiquing glaze that was definitely brown. I added some white latex paint to it and it still looked a little heavy and thick so I added water. And seriously, you can just mix the paint and water, you don’t need the glaze but I think it gives you longer working time with the finish. 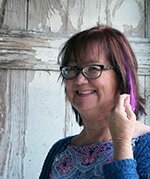 I know…not much help am I. I kind-of wing it. I mix stuff until I get what I want. Don’t be afraid to experiment and try new things. It’s only paint and you can always paint over it or try a different technique if it doesn’t come out right the first time. Anyway, what you have is like a white-wash. I brushed the white wash glaze paint (frosting) on and wiped it off with a wet rag. You need to wet that rag and keep it handy or your frosting will be too heavy. Wipe it off until you get the look you want. You can always do a practice board if you aren’t sure of the technique. And don’t try to frost the whole piece at once. work on one area at a time. 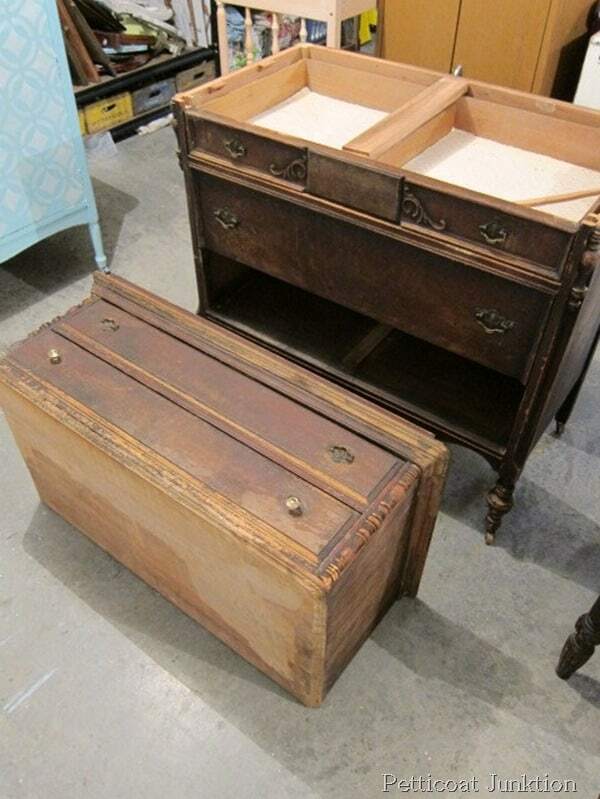 I applied frosting to the casing of the chest only, not to the drawers. I made a tutorial on how to white wash furniture. It’s short and sweet….. I know ya’ll are going to be shocked…… I didn’t do any distressing on the chest, not even the hardware. So what do you think of the frosted paint finish? Are you going to try frosting a piece of furniture? I love this piece so much I’m thinking of changing out my bedroom furniture for this. If you remember I re-painted my bedroom furniture just a few weeks ago. The color is very similar to this. In fact I wanted the paint color to be similar because I liked it….a lot. Update to post (January 29, 2018) . Click here to see the complete tutorial including a video by yours truly on how to custom white wash furniture details. 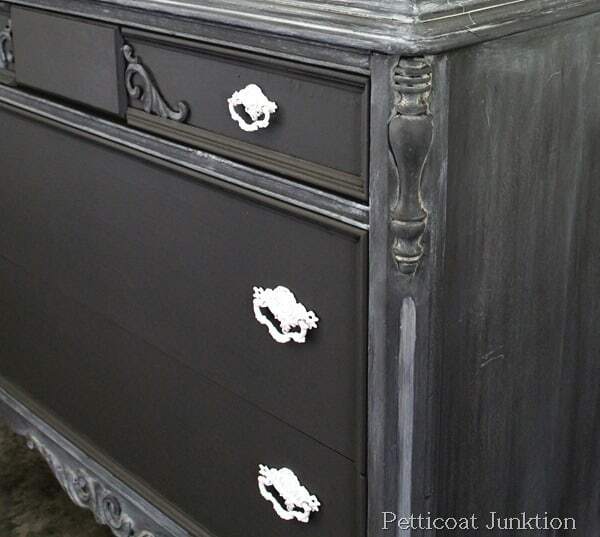 For more Beyond Paint Makeovers click here….15 Beyond Paint Furniture Makeovers . Words couldn’t describe how lovely that one is! I hope you found a place at home for it and kept it your self. very, VERY nice! I know all about horses and how they chew on wood. Good save! And beautiful color choices. As always, you do wonderful things! Merry Christmas, Kathy. It looks beautiful, Kathy! I really like the top drawers painted in the lighter color and I think the white washing would have been over-powering if you’d done it on the front of the drawers. It looks a little like distressing on the turned parts along the sides and brings out the shape and design of them. It’s just very, very beautiful. I would be happy to find it a place to live in my own home. Although, I’m about out of “places” to put any more furniture! 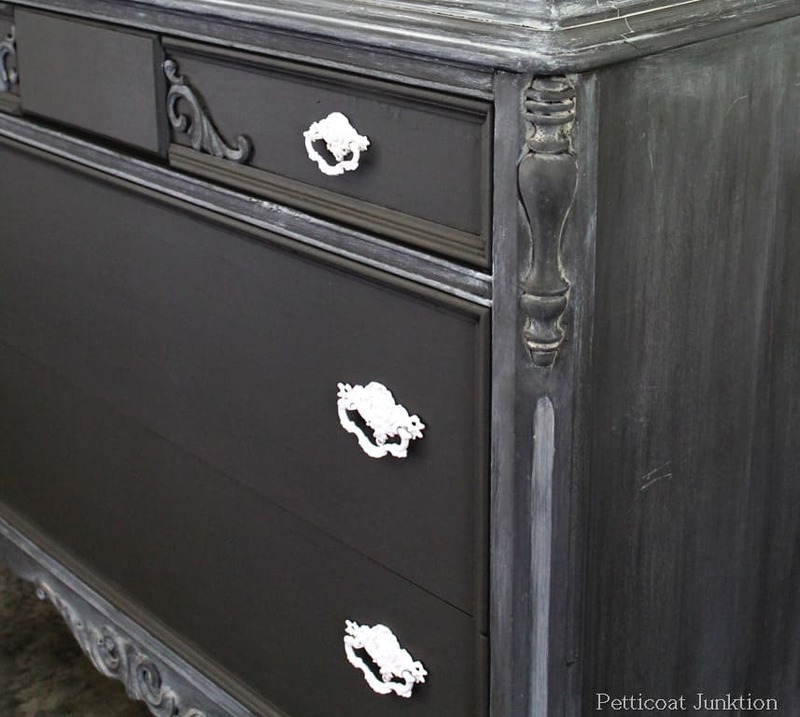 I would like to have something smaller done in the way you did this dresser with the “frosting” technique. Not sure what, but maybe a small table or something. You sure do good work, lady! Even though you wing it and experiment all over the place. Takes a courageous heart to do that! i don’t have a piece of furniture to do, but I looks good-dumb me I thought the frosting was the 2 top drawers! I really like this effect ! I have several pieces of furniture sitting in my basement that I have been wondering what I want to do with them. I think I will try your “frosting” technique on them. You are so clever, and I, like you, love to mix paints and experiment with new finishes. FYI….when you mix your latex paint and water glaze, try adding a little glycerin to it to extend the working time. I also add a little to DIY chalk paint or finishes that I store in jars. Helps keep them from drying up. Again, thanks for the frosting info. Turned out awesome! 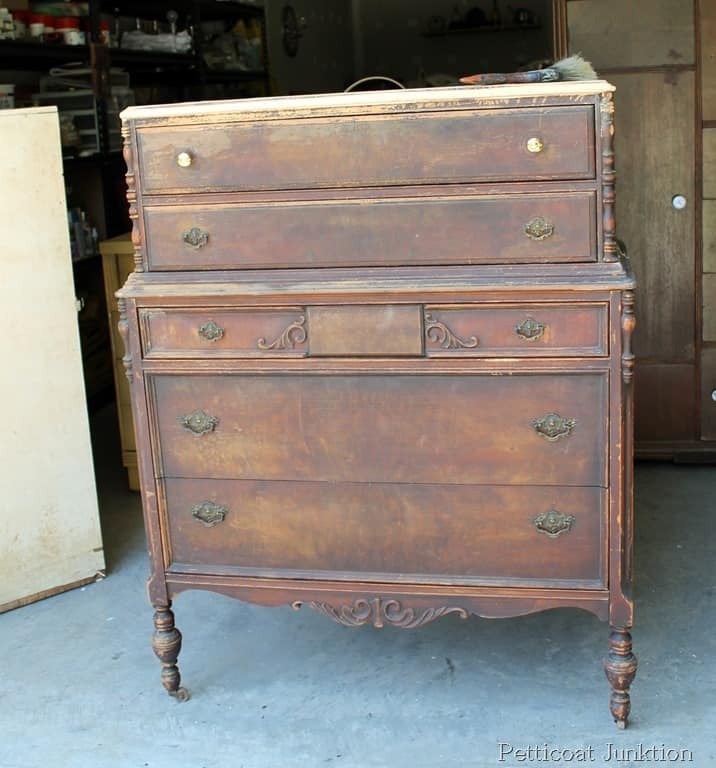 Great save of a beautiful old chest. I love that you are not afraid to experiment. I think you might get close to this finish by using white wax, it would be something to consider if you are not as adventurous as Kathy. Man, who knew horses were little woodchucks? That looks awesome! I am so in awe of this piece! I am loving this gray with frosting and am saving it to my favorites and pin it… to re visit when I need to PAINT SOMETHING!!!! Love the look. Couple questions ….do you put any kind of finish on the piece after the frosting? Is the paint a satin or semi gloss finish? I’m just getting into this painted furniture thing and lov’in it! It’s stunning, Kathy! Great tips, gorgeous transformation! All the different tones of gray are so beautiful!! Wow! It is gorgeous! I have never heard of this frosted paint finish before, but I am lovin it! I made up the term frosted. It might be a real paint term, I don’t know 🙂 Thanks for the party invite! You do such incredible work! 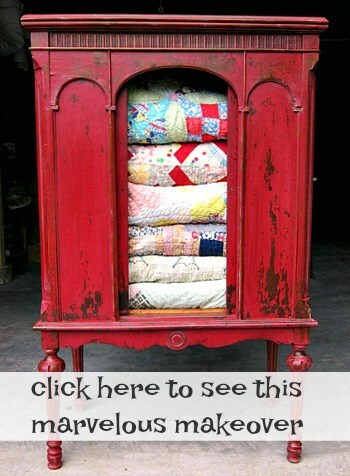 Always such a joy to see what you are up too:) Pinned of course, it’s a beaute!